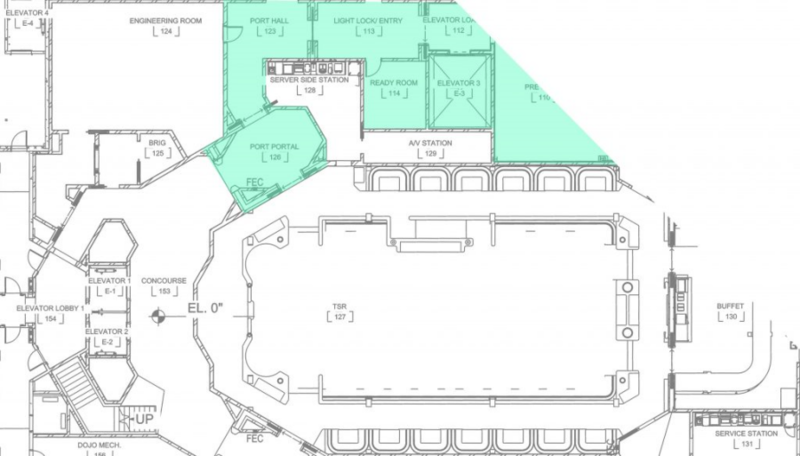 Disney has been somewhat tight-lipped with details about the new Star Wars-themed hotel being built next to Star Wars: Galaxy’s Edge at Disney’s Hollywood Studios, but thanks to a permit that was filed recently with the Florida Department of Environmental Protection, we are getting our first look at a detailed layout for the upcoming hotel. California Coaster Kings uncovered the permit and has color-coded many of the images to make analysis easier. The first image [above] is a complete overview of the hotel, with guests rooms (cabins), dining, and more highlighted. The entry area, with a futurist porte-cochere, leads into a security area, where it appears guest luggage will x-rayed and guests will undergo metal detector screening. After leaving the security area, guests will enter a Elevator Load room, where they will be “transported” to the hotel. It’s not yet know if this will be an actual elevator or a simulator. 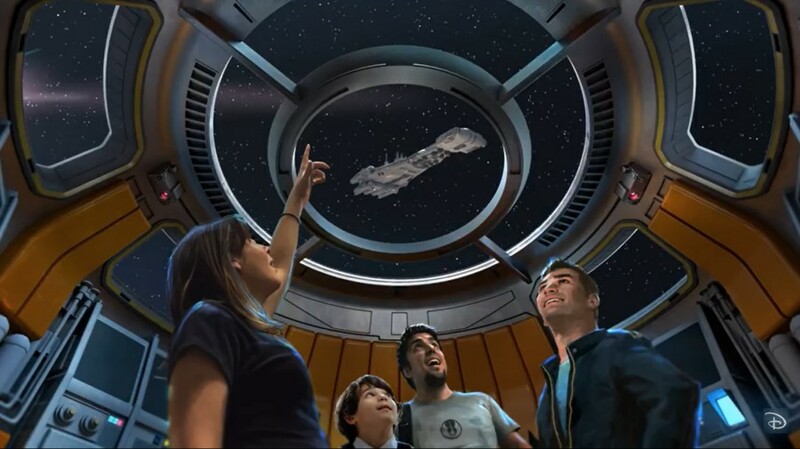 Back in February, Disney released a peek at what that elevator-experience might look like. The hotel is expected two stories tall, so the experience could differ based on room location. 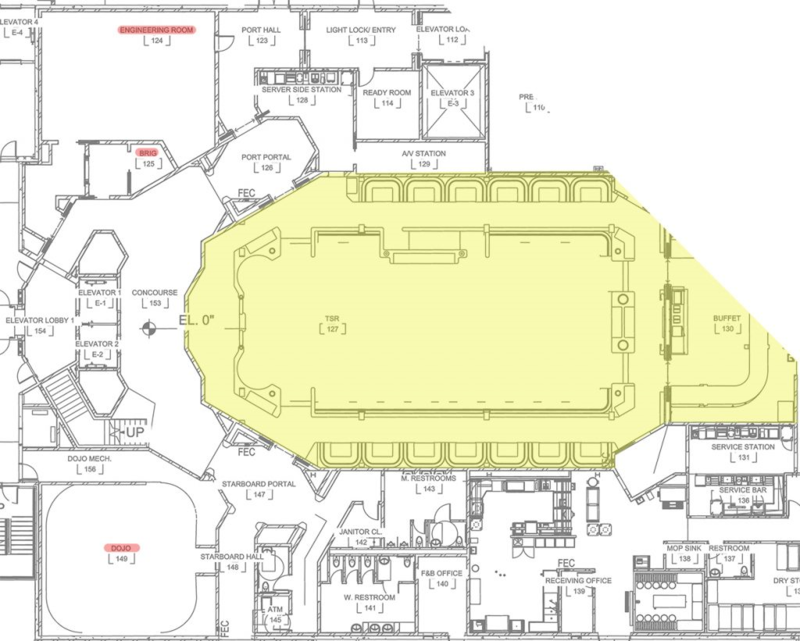 The main public space (highlighted above in yellow) features a table-service restaurant and buffet, along with a concourse and elevator lobby. Also in this area are rooms which could relate to story elements, including Dojo, Brig, and Engineering Room. 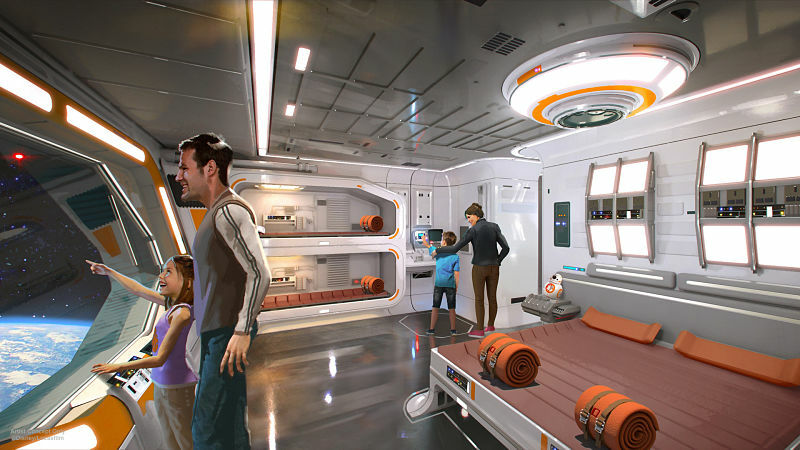 Other than the relative size and the fact that a 1st Class Cabin will be available, the permit doesn’t give us much more information about the guest rooms. 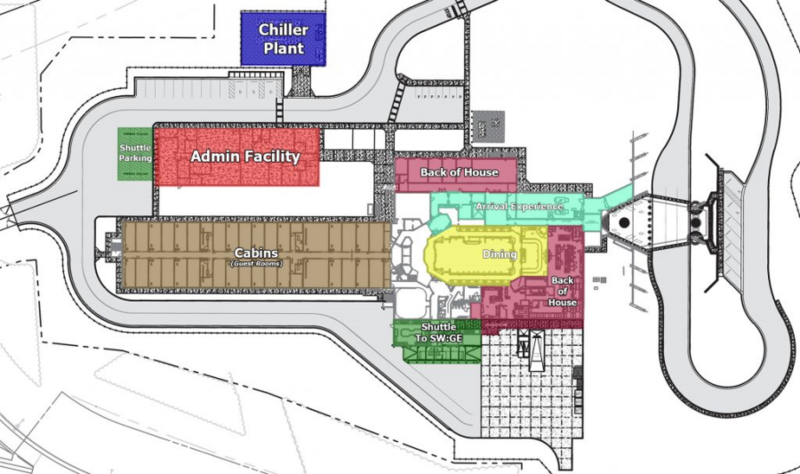 Only 32 rooms (or cabins) are in the graphic for the first floor, but it’s not known how many guest rooms will be on the second floor. 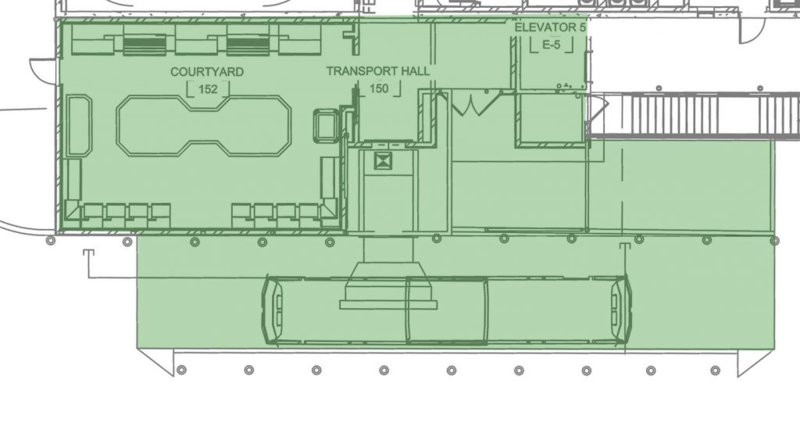 Finally, we get a look at the Transport Hall, where it appears that guests will cross a gangway to board buses for transport to Star Wars: Galaxy’s Edge. While there is quite a bit of new information in this permit, there is much more to come!